This social media audit is research and a report that gives you all the insights and recommendations you need to make your social media output and engagement transformative for your organisation. Perfect for a team with bags of potential, and ready to take your organisation's social media to the next level. 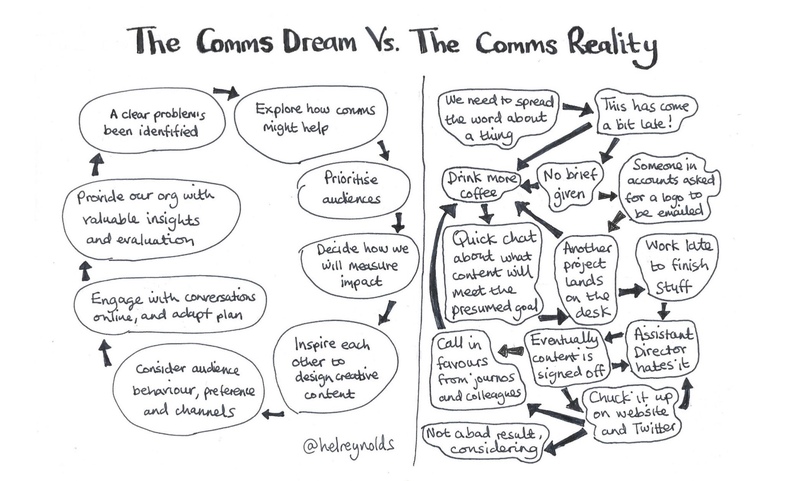 Hel will help you use what you've got to become a leading comms team in your sector. 1. An hour introductory call with Hel to establish your goals and achievements to date. 2. You issue Hel with any relevant materials and she analyses any communications, and business plans, as well as communications materials and social media feeds. Providing Hel with temporary access to your social media analytics ensures you get the best insights and recommendations. 3. You will be issued with a practical report with a social media health check: how you're doing, best practice to aim for, and how you get there. This will include a skills overview, highlighting the social media/comms team's strengths, the critical skills that need developing, and how to bridge the skills gap. 4. Hel will deliver a one day masterclass with the communications team to address skills gaps, inspire strategic and creative communications output. 5. The communications team will all have one year's access to an online resource with training videos, communications planning templates and other resources. Book now with the link below, and email Hel on helen@socialforthepeople.com to arrange your introductory call and start the social media audit process.